In this post: My 3rd Pixar Camp post. Finding Dory crafts and activities! Hello, Dear Ones! This Summer we’re having Pixar Camp! Basically, we watch Pixar movies, make themed treats, and have fun activities. This is the third post in the series. 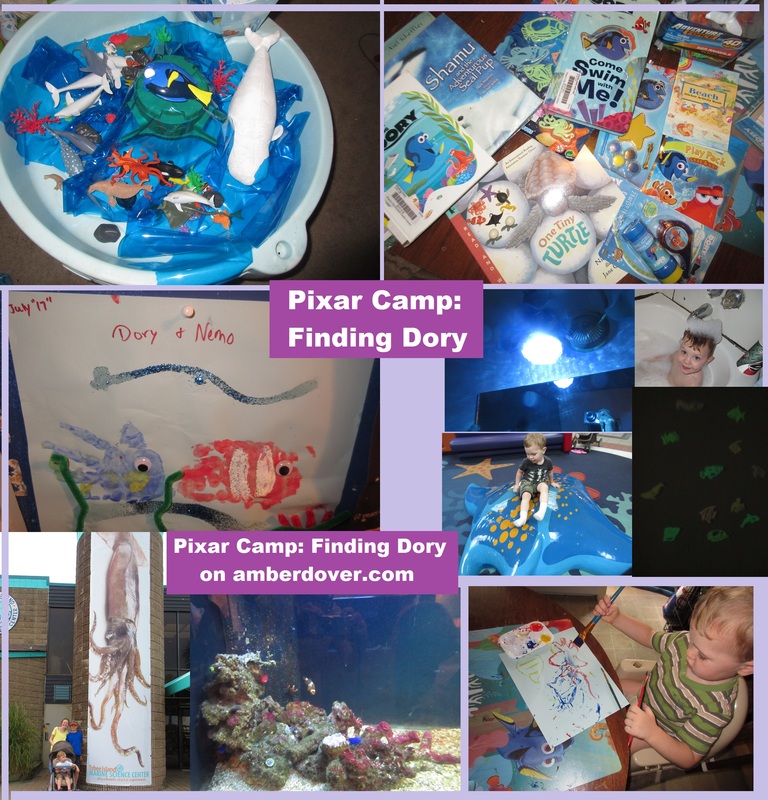 We spent a lot of time having ocean-themed fun to go along with Finding Dory and Finding Nemo! These stuffed Nemo & Dory fish were on sale at Walmart. Blue cellophane makes a nice ocean. Stickers and coloring kit came from Dollar Tree. I found the dominoes at a thrift store. Thankfully Dory is still popular so you can find the merchandise easily. Hermit Crab craft from our End of the Year party at our Homeschool group. We read several ocean-themed books. Pastel Resist Sea Animals- I drew sea animals with crayons and Leeland painted them with watercolors. The crayons resist the water color. Ocean-themed Playtime! Blue cellophane and a bucket of sea creatures from Walmart in the water table. Bath time fun with bubbles, ocean toys, glow in the dark fish, & a blue light! Blue Waves– I attached blue cellophane with a rubber band to a spinning light. It looked like waves on the ceiling! Leeland called it “fireworks”! Our whale tent– I thought about adding eyes but we used our imagination. Tybee with Grandma- We visited the Tybee Island Marine Center with my Grandma. We even got to play in the touch tank (something on Finding Dory). We learned about the rehabilitation of sea creatures on Tybee. They rescue and release sea animals just like on Finding Dory! Water table fun with water and sand! Previous Previous post: Left Behind?